The Dartmoor Centres have been providing residentials to schools since 1963. In that time we have worked with thousands of schools and provided life-long, happy memories to hundreds of thousands of children. We have an excellent safety record and a legendary reputation for high quality home cooked food, friendly and helpful staff and comfortable accommodation. The centres are operated by Babcock LDP which is a joint venture between Babcock Education and Devon County Council. The Head of Centres is also the Local Authority Outdoor Education Adviser so you can be assured of the highest safety standards and high quality activity instruction. 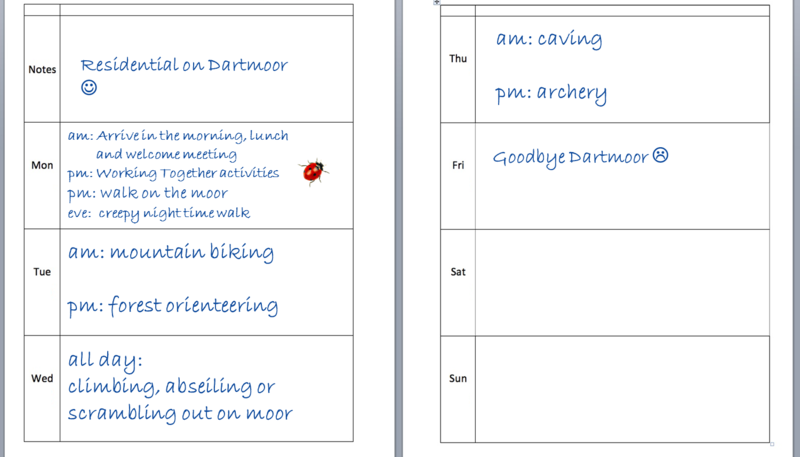 Whether you are looking for an all-inclusive adventurous activity residential or just want to be on Dartmoor to do your own studies, you will be made very welcome at The Dartmoor Centres. With expert guidance from our qualified instructors you’ll construct a Tyrolean traverse across a local river to cross from one bank to the other without getting wet! Lots of laughs and great photo opportunities. A much-enjoyed activity, delivered by our own qualified tutors. Archery sessions reinforce the teaching of safe practice, using firm guidelines and codes of behaviour, as well as developing listening and sequencing skills, whilst of course having fun trying to pop the balloons. The Dartmoor fringe is home to some extensive and nationally important cave systems. The caves at Pridhamsleigh offer a great opportunity for new and experienced cavers to explore the underground world. Sessions are led by qualified cave leaders and we supply caving suits, helmets and head torches. See the sights and sounds of Dartmoor as we head out into the open moors to experience the wildlife, history and spirit of this unique landscape. Either a half-day circular walk from the Centre or a whole day reaching deeper into the moors taking our necessary provisions with us. Learn some of the skills of our Dartmoor ancestors! Fire lighting and shelter building form the core subject areas of this exciting and engaging session. Projects will depend on group size, age and conditions. This is a chance for groups to get up close and personal with the very stuff that Dartmoor is made from ‘gripping granite!’. This can be a half or whole day session and may include any of the tags mentioned above depending on preference, weather and group size and ability. A crepuscular creep down local paths on the lookout for nocturnal encounters, or we’ll head out onto the open moor for a taste of Dartmoor after dark. Maybe we’ll catch a stunning sunset or marvel at the milky way depending on the time of year. Explore forest trails with a qualified mountain bike leader. Route options vary according to the ability of the riders making this session inclusive to all. Non-riders, even get the chance to learn to ride a bike at their own pace. Fire bread and nettle tea (or perhaps hot chocolate!) are just some of the tasty morsels on the menu during this session. Best combined with the above bushcraft session for a full day bushcraft experience. Participants learn map reading and navigation skills and are then challenged in small groups to put their skills and teamwork to the test! We have a simple course in the grounds of the Centres and we have also established a much larger course in a nearby forest. This is a popular and rich learning experience offering the opportunity for safe remote supervision where appropriate. There’s an emergency on the moor! Can the group come together and use their skills and teamwork to save the day? Skills practiced include search techniques, communications, basic casualty care and improvised stretcher building..
A series of tasks and challenges designed to explore the skills and benefits of good teamwork. Based in the Centre grounds using simple props, this session is a good kick start for a residential programme.